Identity crisis? No, I'm a primary school teacher! : The lesser spotted male teacher....are gender results afffected? The lesser spotted male teacher....are gender results afffected? Male teachers get rarer as pupil age decreases, and the numbers fall to 3% in Nursery. As an interesting comparison, 10% of the British Army is female. 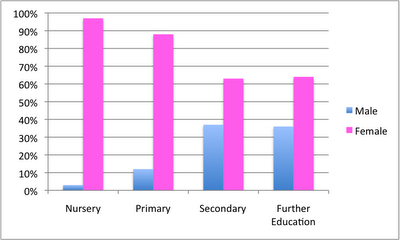 DfE stats for English & Maths at the end of KS2 (Primary) in the same year show girls outperforming boys by 5%. GCSE results for the same year show girls outperforming boys by 7%. Is it coincidence that the gender performance gap is so massive in Nursery/EYFS, where the chance of having a male teacher is almost negligible? There's plenty of academic research suggesting teacher gender has no impact, but I haven't managed to find any based on the actual performance of children who have been taught by men versus women. • provide a range of mark-making and craft resources so that children can create representations of Spiderman and webs if they wish. • look at real women and provide further information. Personally I think we need something much closer to a 50/50 split of male/female teachers across all education age groups in order to better reflect society in general. However, having just enjoyed my school's Xmas night out (60 women and 5 men), I'm prepared to wait for things to change! I love how you turned those tips around. I make the same argument, that anything short of near equity in gender numbers so that wider society is reflected in the staffing is a cop out, but we also need to be realistic. Norway has increased male educator percentages to 10% in their outdoor preschools & there seems to be many more men in the nature/forest schools compared to traditional services so getting outdoors & connecting with nature could be a starting point. it would also benefit the chilren greatly. There's some of my thoughts anyway. Keep up the good work Shrek! Thanks Greggles. Is nice to find someone in a similar situation as me...I am following your blog with interest! New Technology in EYFS...the Computerlator! One third of children don't own any books!